Dylan came to us last year in the autumn. We picked him out just by looking at the pictures on internet and then we just know that’s him. 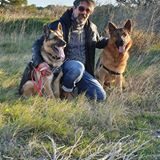 So one day we went there asked for a walk with him together with Moira, he was pulling a lot on the lead but very happy to come out for a walk made no physical contact. I watch him play with another dog in a fenced in area it was a full on play between two equally sized dogs, and I manage to exchange some words with the trainer in French. I soon understood that Dylan was one of his favourite dogs. My husband and I stood and looked at Dylan playing and agreed that this felt right so we signed for Dylan but we said we needed a week before we got him to fix things at home. I also took the trainers phone number. 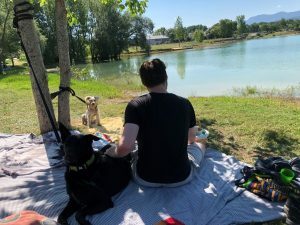 The day we picked Dylan up we had no long line for him so Vincent (trainer) gave us an old one so Moira took a photo of us and then we went to the lake in Carcassonne me and my husband and a friend of ours. We took a long walk Dylan loved to play in the water but not swim. I sat in the back seat with Dylan strapped in the whole way he lay in my lap. We got back home and he looked at everything in the house. Every walk we did he pulled a lot and was very nervous and had diarrhea. He also reacted when the fly squatter came forward as if I was going to hit him the same reaction with the broom. So then I texted Vincent and ask if he could help us with Dylan. Vincent came around 10 times once a week, Dylan was so happy to see him and he trusted him. We worked on different things together. To make him not to pull, stay, sit, lay down, and not eat food in the park. We manage everything exept for the food in the park. 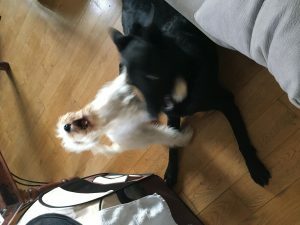 I always talk to my dogs I believe they understand a lot of people laugh when I tell them but then I was at a conference in Sweden and listened to a professor who proved that a dog has an intelligence of a 5 year old and can understand 1500 words. I use a combination of words and signs when I communicate with him cause some days if it’s a lot of stress that day I just use signs so he does not hear the stress in my voice. After about 6 months Dyland behaviour changed, he was calmer but then he begun to guard me and at the same time show that he did not trust other people so I had to do a lot of training in those areas we decided to go to Jorg Limacher so we went once a week and Dylan made a lot of progress. 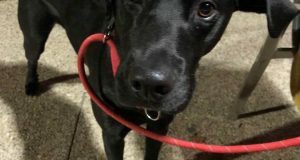 We don’t know Dylans age or breed but we guess he is around 3 years old and are a cross of groendal, labradour and something else. He is black 30 kg. He is a very clever dog, loves to be near the family but he does not like cats. People who are friendly and doesn’t touch him no problem. 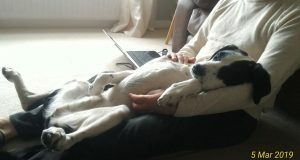 If we introduce him to other people in our home he wants to get a cuddle but not before. Other dogs no problem so far. We also took the decision to bring a puppy in the family so we got a mini schnauzer a male, what a great decision Dylan loves Prince and they have so much fun together its like Dylan grew up and got a better self confidence with a puppy in the house. Before we had dogs in the family then we had a Maremmano abruzzese , and a Tervuren, schnauzer. The other day I came back from a walk with Dylan and my door is in an alley and two drug addicts came towards me and I could feel it’s a problem here. So I said to Dylan stay and stood still and these men came up and starting to complain about me standing between them and the dog and they just asked for trouble. So I just waited until they stopped talking all this in French which I am not fluent in. After a couple of minutes they started walking away and me and Dylan was just 3 meters from our door so I moved towards the door to go in then the one of the guys change their mind and turned around and was moving very quickly and in a threatening way towards me but he got stopped in the air by Dylan who just screamed and jumped up in the air with open jaw and slammed them in front of this guys nose. !